Nessie Reid is a Spiritual Ecologist and performance artist working on themes surrounding access to land, food waste and sustainable agriculture in the UK, proposing the need for radical systemic change within our current food and farming system: one which is becoming increasingly unsustainable, and unhealthy, for both planet and people. Based on an organic farm in South West Wales, Nessie is Programme Manger for The Oxford Real Farming Conference. She is also Managing Editor for Biodiversity – a Journal of Life on Earth: a quarterly, scientific publication from Biodiversity Conservancy International, a role which keeps her updated with wider, global ecological perspectives. Having received a research scholarship from the School of Oriental and African Studies (SOAS), Nessie researched the role indigenous art in preserving diasporic Tibetan culture and religion in Himachal Pradesh, Northern India and Nepal, as well as the impact Chinese rule has over Tibetan identity and cultural heritage. This fuelled her interest in the link between agriculture, land-grabbing, ecocide and climate change. Following her degree, and based on this inquiry, Nessie worked in India, the Philippines, Japan, Spain, Italy and Indonesia for the ICCA Consortium. During these three years she witnessed the catastrophic ecological damage caused by large scale intensive agriculture – namely oil palm – and the displacement of local and indigenous communities as a result. Returning back to Bristol, her home-town, Nessie began working as Project Coordinator for This is Rubbish, a community-interest company, aiming to communicate the preventable scale of food wasted in the UK, through policy research, community and arts led public events. She co-coordinated Stop The Rot: a campaign to engage one major grocery company and four MPs in committing to piloting and advocating a one year food waste audit. Before moving to South West Wales, she was also part of the internal core team for Beacon Farms: a Community Benefit Society training a new generation of sustainable food producers on Bristol’s fertile Blue Finger land. Hi Nessie, I’d really like to have a chat with you about your project.. I ran a pilot project last year http://www.cowgirlparlour.org and am continuing the work this/next year….. please do contact me if this is of interest… Christine. This is brilliant Christine. I’d LOVE to talk to you about this. It looks fascinating, and very relevant. I am keen to collaborate with other artists working on these issues. What’s the best way to get in touch? Super. Well, we could arrange a time to talk on skype – christineannewatkins. Or, we could meet in person for a cup of tea, which might make for a better conversation! I could meet you in Bristol for a chat next week when I’m passing through (Mo,n Tues, Weds. all possible). let me know what suits you – email christinewatkins1@googlemail.com. Hi, why are you promoting dairy, one of the cruelest forms of animal commodification? Dear Bonnie. Thank you very much for your question. 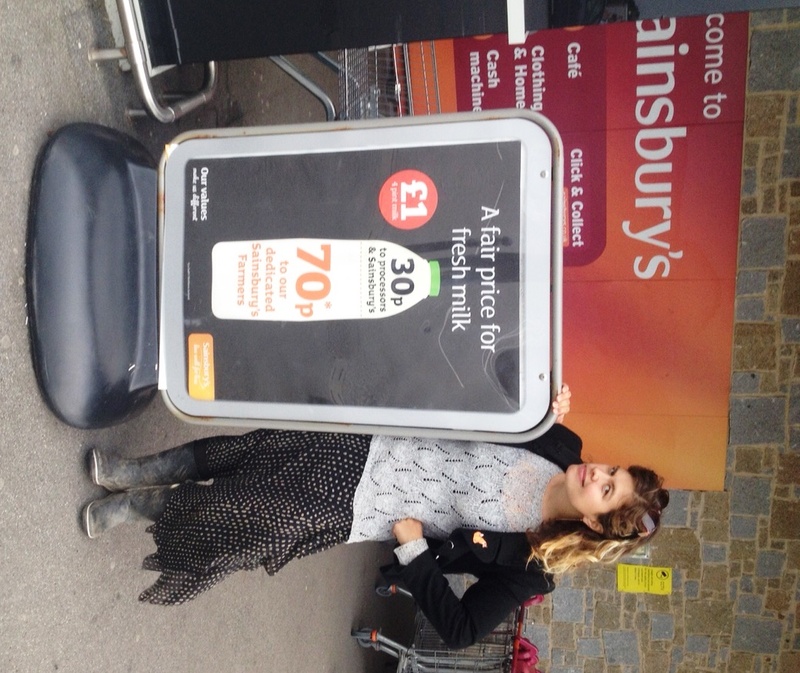 I would not say I am ‘promoting’ dairy. The purpose of The Milking Parlour is to encourage people to interrogate where their food comes from, exploring how we can to better value the farmers and the animals who produce our food, rather than simply always going for the cheap option – which supermarkets tend to push the consumer to do. It is about creating a public space where discussions and debate can take place, rather than a black and white ‘wrong or wrong’ answer. Thanks very much Nick. I’m pulling together my resources list next week, so I’ll let you know if we need anything else. I like the mini moo holiday home’ idea. What you’re doing is important and relevant and needed. Trying to create the conditions for real conversations about real issues in a way that brings diverse perspectives together (rather than consolidates ‘camps’ and ‘poles’ and ‘opposites’) is the hard road, not the easy road. But, in the long term, it’s the only road to a world where we can live together, conscious of the reality of different perspectives, and the only way to find the ‘way through’ to a better, more sustainable way of living in and on Earth. So… thank you! For your creativity and your commitment. And your brilliant project. Inspiring!